Sometimes, we stumble across things in our lives that awaken a sense of wonder we thought we lost somewhere in our childhood: a beautiful sunset, a hidden waterfall, a shooting star… And this Life-size Pirate Skeleton. There are so many questions here… How did this sea-faring brigand lose his hand? Was that before or after he lost his leg? What that before or after he lost his eye? Did he fight in crazy glorious sea battles against the British Navy? Was he just really clumsy and accident-prone? How have his stylish accessories held up so well when his skin and muscles melted away decades ago? How has his peg leg not deteriorated? 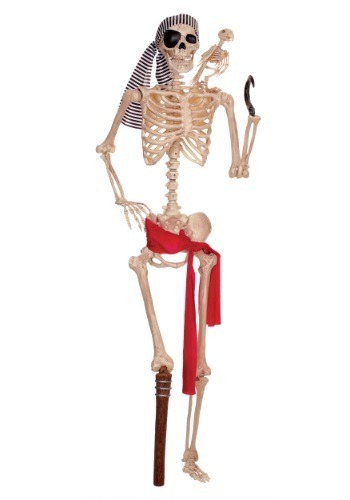 But what we do know is that if you set up this Lifesize Pirate Skeleton for your next themed party, it’s sure to be a hit. Anyone can throw a few plastic skeletons around. It takes someone with vision and imagination to include one as enigmatic and appealing as this guy! He’s five feet tall and fully poseable, plus he comes with a handy hook if you want to hang him up. No matter what you do with him, he’s sure to be a hit!